This year at Butterflies our skilled, independent florists can make by hand anything from a single red rose to a luxurious bouquet that really pushes the boat out. What's more, your chosen gift will be delivered by hand! There are no couriers and tatty cardboard boxes here! Making your romantic Valentine's gift extra special. 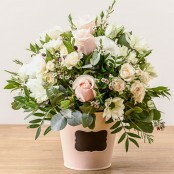 There's even the option to send champagne, chocolates, teddy bears and balloons if you so desire, all delivered by hand, complete with your personalised card message, ensuring February 14th, or indeed the day before with deliveries timed to suit you, is memorable for all the right reasons. By ordering through Butterflies you'll receive the very best service and value for money, we invite all our customers to star rate the service provided hence you can be sure of top notch service every time! 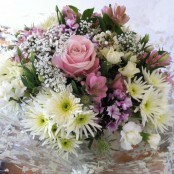 As always with Butterflies, you'll be able to select any of our bouquets after looking at the photos of our work here on our own website. So, what are you waiting for? 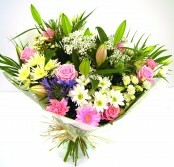 Let us ease the stress of sorting out your Valentine's Day gift by ordering flowers from us. In the click of a mouse you'll have the perfect gift sorted! On behalf of the team at Butterflies, have a great Valentine's Day!